There are no photographs of bison spilling by the thousands across the Great Plains. By the time cameras came along, most of the bison were gone. John Wright of Fairbanks believes he has an Alaska version of what that photo might have been. 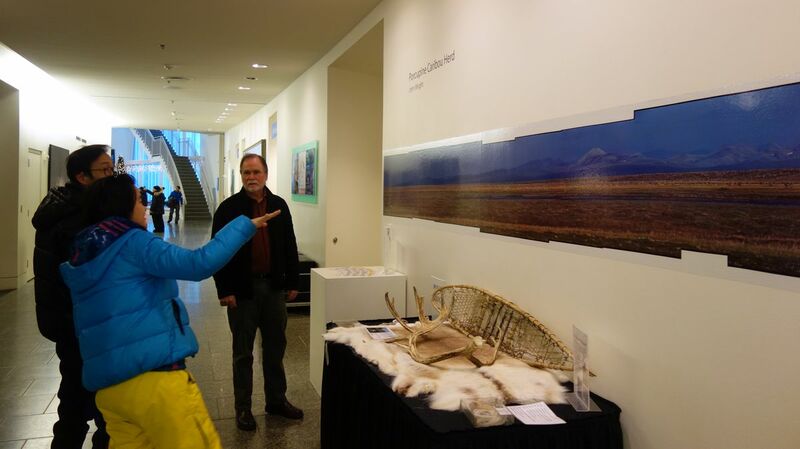 His image, 12 slide frames stitched together to show the Brooks Range rising from northern tundra, is papered on a wall of the University of Alaska Museum of the North. It takes 10 steps to walk past the panorama, a vinyl print mounted at eye level just across the hall from Otto, a preserved brown bear that stands 6 feet tall. Wright's image shows purple mountains above the orange-brown flats of northern Alaska. The coastal plain — miles of tundra carpet between the mountains and the ocean — is packed with caribou of the Porcupine herd. The animals resemble tan ants scrambling over treeless hills. Counting them is an intimidating proposition. Wright, 69, was doing just that when he captured the image on July 4, 1979. The biologist and a colleague were on the ground identifying caribou as newborn calves, yearlings, bulls and cows while other biologists were taking pictures of large groups of animals from a de Havilland Beaver. The airborne counter aimed a camera straight down, exposing negatives that were 9 inches square. Later, someone back at the office in Fairbanks then spread photos on a big table and counted all those caribou. On that July evening, Wright was sitting on a hill 4 miles south of the Beaufort Sea. "We watched them flow by us for four hours or so," Wright said on a recent visit to the museum. "They were so close we could hear them grunting. It smelled like a stockyard. By that evening we felt we had 90,000 in the valley." Late that summer night, Wright lifted his Pentax camera mounted with a 300-millimeter lens. With the sun high in the sky to the northwest, there was enough light that he did not need a tripod as he turned along the horizon, snapping when he thought frames overlapped. When Wright had his slide film developed, he realized he captured something no one had while bison were abundant on the Great Plains. The official Alaska Department of Fish and Game count for the Porcupine herd in 1979 was 110,000 caribou. Last fall, almost 40 years later and after retiring from the department, he carried that image to Washington, D.C. He rolled out a 13-foot version on long tables in politicians' chambers, showing what was at risk if the Arctic National Wildlife Refuge was opened for oil drilling. "It drew a wow from everybody, which was much better than words, or me telling them about birds from all continents converging." Despite the efforts of Wright and many more who lobbied against opening ANWR, a portion of the coastal plain of the refuge became available for oil companies to explore as part of a tax/budget bill passed in December 2017. Wright, who has studied animals from Petersburg to Prudhoe Bay since he first drove up from California when he was 21, thinks the "1002" area of the long-contested refuge is a special place, the value of which is not always visible. The recently opened 1.5-million-acre 1002 area encompasses much of the breezy lowlands favored by caribou in springtime. It is part of the 19-million-acre refuge that extends south of the Brooks Range and east to the Canada border. "Some people called the Great Plains a vast wasteland, and that's exactly what some politicians want to call the coastal plain," Wright said. "At its peak of summer productivity, it's the complete opposite." In January 2018, biologists who manage the Porcupine herd reported counting 218,000 animals during their census of July 2017, almost twice the number of caribou in 1979. Last summer's count is an all-time high for the herd, according to Jason Caikosky of the Alaska Department of Fish and Game, who focuses on the Porcupine herd along with biologist Beth Lenart. Department biologists count the animals every two to four years if the weather is right, now with high-resolution digital photography. The Porcupine caribou spend winters south of the Brooks Range and migrate to the coastal plain each May. There in the tundra hills from northwest Canada almost to the Dalton Highway in Alaska, caribou cows give birth to calves. The herd does not always calve in the same area, but over the years has often favored the 1002 area just opened for oil extraction. The caribou of the Porcupine herd, now a mass of animals that outnumbers humans living in Eugene, Oregon, is an uncommon gathering, Wright said. "In my mind, the Porcupine caribou herd is one of the last large aggregations of land mammals in North America," he said. 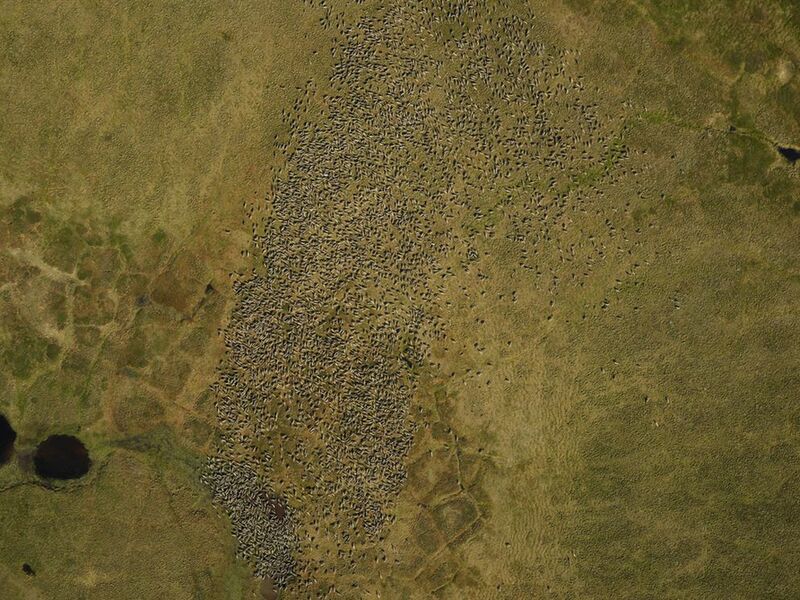 "This is every bit as amazing and unbelievable to see as the Serengeti." Wright thinks development of the 1002 area, and the gravel pads, roads and pipelines that would come with it, would jeopardize the Porcupine herd. He braced for the vote results, hoping the area would remain as it is. "It was disappointing, and a reminder that different people have different priorities," he said. "Not everyone ranks preservation of our few remaining special natural areas and phenomena above all else."